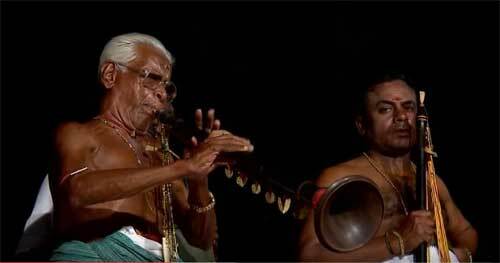 Panar were musicians in ancient Tamil society. The word Panar is derived from Pan, which means a song. Panars were also known as akavar, cutar, ovar, matankar, ceyiriyar, ampanavar, cenniyar, and vayiriyar. The first five refer to vocal musicians. Akavar and cutar were bards who roused the ruler from sleep with songs in the morning. Ovar and matankar were minstrels who extolled the ruler by singing his glory. Ceyiriyar were musicians who sang in combats (from cevir, combat). Ampanavar were those who played on a stringed instrument in the shape of a turtle (ampanam). Cenniyar were those who played on a skull-shaped drum. Vayiriyar were those who blew through horns, and matankar were those who played on a matankam, a small drum. This classification shows that they were categorized on the basis of the musical instruments they played. Among the itinerant artistes of early Tamil society – such as kuttar (actors), viraliyar (dancers) and porunar (masqueraders) – panar (the musicians) stand out as a special class by virtue of the various functions they performed both at the home front and the warfront. They were at once entertainers, mendicants, and also messengers and counselors to rulers. The tinai societies, panars were accorded due honor on account of their artistic ability and their role as custodians of traditional wisdom. Even chieftains took their counsel when necessary. This state of affairs continued well up to the age of the three Tamil monarchs. The temple institution also changed the character of panar tradition markedly. A panar then sang in praise of deities instead of kings. Two important groups of them were the Shaivite musicians, called oduvar, who chanted Tevaram; and their Vaishnavite counterparts, araiyar, who sang Divyaprabandham. These musicians have kept the tradition of Tamil music and culture alive for thousands of years until today. Besides oduvar and araiyar and the isai vellalar, there were also several communities of panar scattered throughout the country. Similar communities like Tiruvaranganpanar, Minpidippanar, kuttaikattipanar and pulluvapanar of Kerala can also be traced back to the ancient Tamilpanar. Source - Encyclopedia of Hinduism Volume VIII - IHRF - page 1.